This week’s round up of the J. League saw the hunted meet face to face with the hunter at the Big Arch Stadium in an all-out push for the title race. League Leaders Vegalta Sendai travelled to face a strong Sanfrecce Hiroshima team hot on their heels for a chance to go top of the league, but with the hunter’s falling six times at home this season, nothing less than a 100% percent performance will do the job for them. The action got under way with an intense first half that see home team Sanfrecce come away with the best chance of the half on the 38 minute mark, but no way pass goal keeper Takuto Hayashi both teams head to the dressing room goalless at the interval. The teams return to the pitch knowing a draw wasn’t part of their manager’s plans and a goal was needed to heat up the contest if they are to meet the manager’s requirements. Sanfrecce the home team provided just that within minutes of the restart to go 1-0 up with midfielder Kazuyuki Morisaki drawing first blood 48 minute in the second half. Leaders Vegalta Sendai feeling the pressure responded well in the 66th minute with a free kick taken just outside the penalty area but was denied by the ever present crossbar. The leader continues to pile the pressure on and was soon back on level terms when Shingo Akamine Shingo equalized for the visitors in the 70th minute to make it 1-1. The balance in score didn’t last long as Sanfrecce struck again from a second chance at a shot that was initially covered by goal keeper Takuto Hayashi but fall in the path of Yojiro Takahag who fire home from close range putting the home team within minute of going top of the J. League. The final goal proved to be the decisive one and Sanfresse Hiroshima return to the J. League summit at the expense of then leaders Vegalta Sendai. Yokohama F-Marinos goes down 2-1 to Urawa Reds. Third place Urawa Reds travelled to the Nissan stadium knowing a win over Yokohama F-Marinos could possibly propelled them to the top of J1 for the first time this season but their hopes were crushed by the Reds. Gamba Osaka 1-1 Albirex Niigata: The fight for survival this season has become a tight contest. 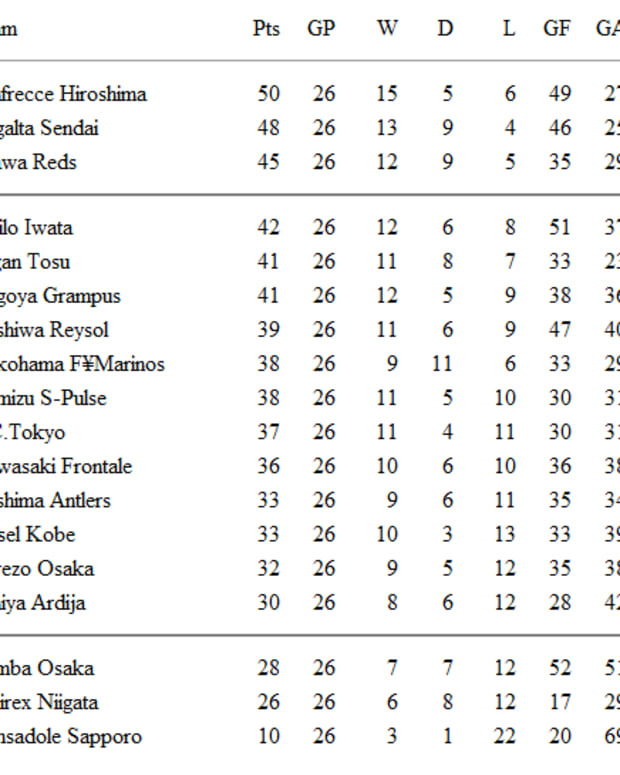 Gamba Osaka and Albirex Niigata were both on 24 points with Gamba just above Albirex on goal difference. Kawasaki Frontale 2-2 Kashima Antlers: Kawasaki Frontale and Kashima Antlers were both on 32 points heading into Round 25. The Antlers were ahead on goal difference and hasn’t defeated Frontale in league play for almost 2 years. Cerezo Osaka 0-2 Nagoya Grampus: Cerezo Osaka and Nagoya Grampus were both fresh off a two-match winning streak going into their Round 25 encounter. Shimizu S-Pulse 1-1 FC Tokyo: Shimizu S-Pulse and FC Tokyo faced each other for the second time in ten days but unlike the previous encounter that saw FC Tokyo walk away 2-1 winners but this match was evenly contested. Omiya Ardija 1-0 Sagan Tosu: This contest saw fifth place meet second from bottom with both teams aiming at two different objectives one for J. League survival and the other trying to keep pace with the leaders. Kashiwa Reysol 3-1 Consadole Sapporo: Champions Kashiwa Reysol who lost grounds on the leaders win convincingly over Consadole Sapporo. Vissel Kobe 1-2 Jubilo Iwata: Jubilo Iwata another team keeping withing touching distance of the leaders were looking to solidifies their title aspiration but haven’t beat their opponent since since September 04. Get more great soccer news and analysis over at at Top-Soccer.